Ultra Street Fighter IV won't be the end for Capcom's wildly lucrative fighting game franchise, at least not if producer Yoshinori Ono has anything to say about it. Street Fighter first appeared in Japanese arcades in 1987, and since that time has spawned countless sequels, spin-off titles, comic books, film adaptations and one very poorly-conceived Saturday morning cartoon series. Calling it a "cash cow" would be an understatement. 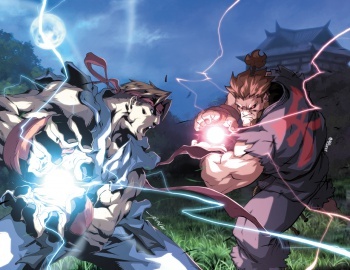 Is it any surprise then, that Street Fighter producer Yoshinori Ono would like to see the franchise continue indefinitely? Of course not, but what is surprising is how realistic Ono is about the developing new Street Fighter titles, and the potential for the series to head toward a "free to play" business model. "Personally, I don't want to stop Street Fighter's main numbered series at IV," Ono said in a recent interview with 4gamer (courteously translated by the good people at Siliconera). "Realistically speaking, developing a title for next-gen consoles requires a huge amount of staff members, and a large sum of money. The issue of money also applies to everyone else, as it'll be required to invest in a new console, game, and arcade stick." Alright, so developing Street Fighter V for upcoming consoles will be a financial risk, so why not adopt the increasingly popular free to play business model? According to Ono, there just isn't enough evidence out there proving that the model works for fighting games. "If you look at fighting games as a competitive sport, one might say the more players, the better. Going F2P lowers the hurdle of needing money to start, which I believe is one the ideal parts about it," Ono states. "On the other hand, knowing whether a company can [recoup] the development cost is something to which I don't currently see an answer. So, I'd like to think about it a little more after seeing how well [Tekken producer Katsuhiro] Harada and [Dead or Alive producer Yosuke] Hayashi handle it." Ono then goes on to describe the gems system seen in Street Fighter X Tekken as an early attempt to gauge consumer interest in items they could buy to become more powerful. While this is one of the main concepts propping up the free to play model, it didn't work out so well in that game, and many high-level players refuse to touch the title unless gems have been toggled off. In conclusion: Street Fighter V is absolutely going to appear at some point. We don't know when, and we don't know exactly what it will look like, but you can rest assured that as long as people keep shelling out cash for Shoryukens, Capcom will be there to dole them out.